Salman Khan’s Tiger Zinda Hai has broken the Internet with its action-packed trailer and its songs! It seems like the film’s first song, ‘Swag Se Swagat’, the biggest chartbuster, has set quite a few records. The song, in ten days, clocked 10 million plus streams across music streaming and on 22nd November, the video set YouTube on fire by becoming the World’s Most Viewed Video in 24 Hours. Now, sassy and loaded with swagger – this super-fast record-breaking run has set a new milestone for Hindi films. 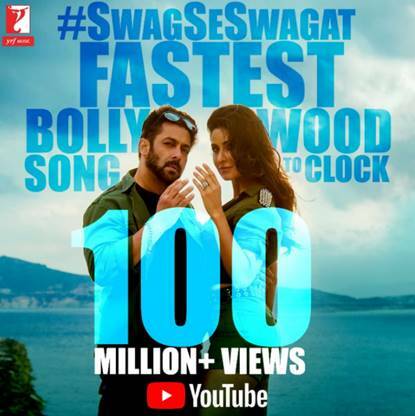 ‘Swag Se Swagat’ has become the fastest Bollywood song to clock a 100 million plus views and that is on YouTube alone! Featuring the film’s hot lead pair, Salman and Katrina showcase their killer dance moves on a visually stunning Grecian island. Not only that, what is so cool is that it features dancers from all over the world. Composed by Vishal and Shekhar and written by Irshad Kamil, ‘Swag Se Swagat’ is sung brilliantly and totally full of swag by Vishal Dadlani and Neha Bhasin. ICYMI or just want to get your groove on again with ‘Swag Se Swagat’ here is the video! The mega-action entertainer, Tiger Zinda Hai, will hit the theatres on December 22. Stay tuned for more Tiger Zinda Hai scoop! 16 queries in 0.495 seconds.